Icom's analog RF circuit experience combined with the latest DSP software technology results in +30dBm IP3 equivalent to the IC-7600. 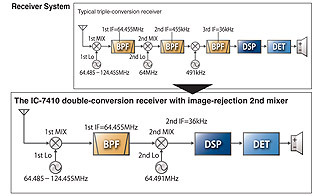 Even in tough RF conditions, such as interference by broadcast stations or strong neighboring ham stations, a weak signal can be clearly received by the IC-7410. The built-in RTTY demodulator and decoder allows you to instantly read an RTTY message on the display. No external units or PC required. The built-in tuning indicator visually helps in critical tuning. The internal antenna tuner covers from 1.8MHz to 54MHz and automatically tunes for low SWR. Variable capacitors provide higher accuracy than a typical mechanical relay tuner. Once you transmit on a frequency, the tuner can instantly retune the frequency using its built-in memory. 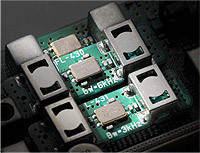 The IC-7410 has a standard type B USB connector and can be connected to a PC. 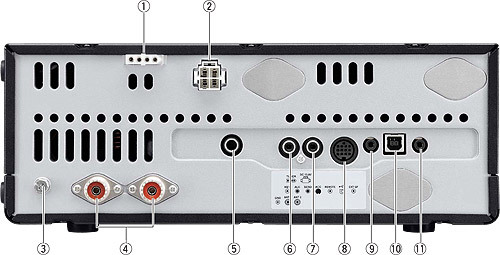 Modulation input, audio output, RTTY demodulator output and CI-V command can be controlled via the USB cable. Also, the conventional CI-V remote control jack is built-in to the IC-7410. 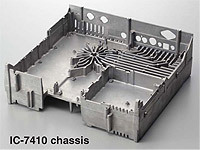 When compared to the IC-746PRO/7400, the IC-7410's large heat sink improves heat dissipation. 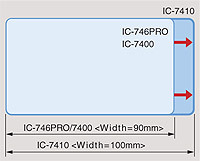 Even during long hours of heavy-duty cycle operation, the IC-7410 provides stable output power. The optional RS-BA1 allows you to use the IC-7410 from another room using your home network or even from a remote location over the Internet. 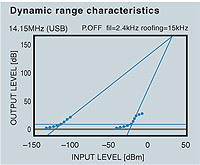 Most settings such as filter width, AGC constant, etc., can be controlled from your PC.